We’ve built our software around a proven sales pipeline management methodology. 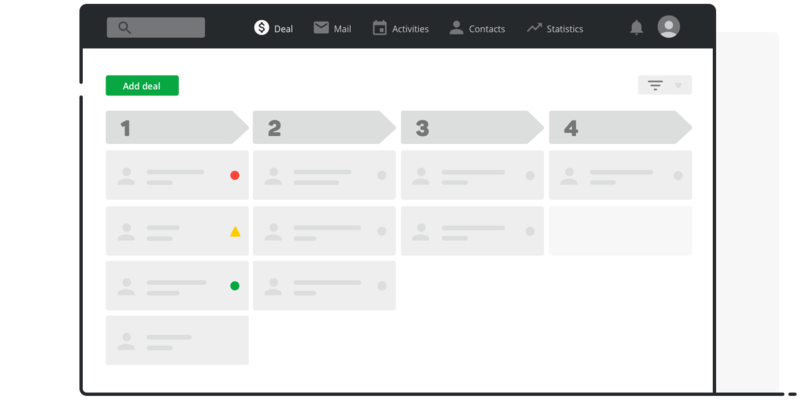 The primary view is the pipeline, a clear visual interface that prompts you to take action, remain organised and stay in control of a complex sales process. This is why sales pros and deal makers love it (their words, not ours). In the pipeline view, deals are categorised by sales stage. This feature allows your team to develop a clear understanding of your sales momentum and priorities, and refocus efforts accordingly. The statistics tool is perfect for quickly getting to the heart of questions you ask every day. It shows you the health of your pipeline, and which stages need improvement. Apply relevant filters to access in-depth and personalised analysis of your sales pipeline, delivered in seconds. Your pipeline is fully customisable to fit your unique sales process. Add as many sales stages, team members or activity types as you need. Give each stage an appropriate name and start completing actions. If there are features you feel you don’t need right now, you can turn them off and on as you wish. Although it remains our key focus, Pipedrive is definitely not only used by salespeople. We have clients who use it to manage workflow, enrollment, complicated projects, rewards programs and much more. Adding deals, contacts or activities to your pipeline is smooth with our intuitive drag-and-drop interface and foolproof menus. The visual layout of Pipedrive ensures salespeople have the visibility they need at all times, and in all places.